If you’re not familiar with JNews Customizer yet, you might need to check our Customizer Overview. For more detail information about Review setting, please visit our documentation about it on this page. 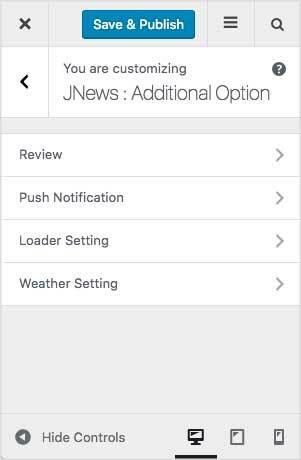 For more detail information about Push Notification setting, please visit our documentation about it on this page. In this part, you can setup general loader type that will be used on certain element such as post split, module block, mega menu, and sidefeed element. Choose loader type that will be using on post split. Please note, this option will appear if JNews Post Split plugin enabled. Choose loader type that will be used on the module. Choose loader type that will be used on the mega menu. Choose loader type that will be used on the sidefeed. Choose loader type that will be used on the sidefeed ajax. For more detail information about Weather setting, please visit our documentation about it on this page.